Incoming theme month, y'all! Last month's Office theme was so well received that I'm continuing the themed-month-ness for July. 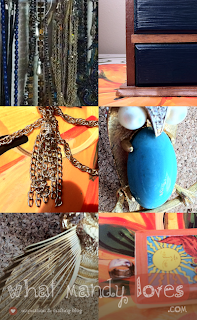 This month is a collection of jewelry and jewelry-themed items like pieces I wear regularly, using jewelry in a different way, and ways to store and display jewelry. Do you have a boring jewelry box or jewelry stand that is just so boring and you don't know what to do about it? Are there a few broaches you never wear hiding in a drawer that you want to be able to show off somehow? I've got some ideas for ya! I'll add details and links to this post later on in the month. Stay tuned!